Self catering accommodation comes in many varieties in New Zealand. Our Guide focuses on Hosted Accommodation that is self contained and, mostly, self catering. It includes holiday apartments and cottages, self catering guest annexes and units as well as a selection of self contained lodges. Self catering accommodation in our Guide is "Hosted" - that is you can expect an on-site host to be there to greet and welcome you. You can expect all linen etc. to be provided and everything to be ready for your stay. Some establishments include breakfast or supply breakfast provisions. B&B accommodation varies enormously from sumptuous, purpose built boutique "lodges" to quite modest private homes. All B&B's usually accommodate just a small number of guests. Similar in many ways to a full Bed & Breakfast, Homestay accommodation is more like going to stay with friends. You can expect a bedroom, often with private bathroom facilities, in your host’s home. Farmstay accommodation is often a "Homestay" on a farm where guests also get an opportunity to see something of real farm life in New Zealand. Many farmstays either offer an evening meal with the hosts or allow guests to use the farm kitchen to cook their own. An opportunity to stay among the vines of some famous New Zealand wines! Here you will find a variety of accommodation styles ranging from full luxury Bed & Breakfast to more rustic self contained cottages, all on vineyards. Hosted self catering accommodation is perhaps best described as a "mini motel", being a fully self contained and self catering, annex or cottage located in the grounds of your host’s home, or at least very nearby. If you have a New Zealand self-catering B&B you would like to list on this guide please click here for information. 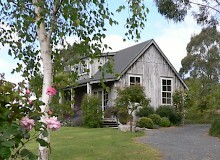 This is where you edit your New Zealand self-catering B&B listing, add a extra listing, and do other exciting things. Northland Region New Zealand Self-Catering Accommodation in Northland - Self-catering accommodation listings. Ninety Mile Beach is just one of the spectacular vast, open beaches of Northland. Don’t miss the sight of the Tasman Sea clashing with the Pacific Ocean at Cape Reinga or the giant trees of the Waipoua Kauri Forest where the Kauri trees are 2000 years old! Ferry across the Hokianga, catch a snapper in Doubtless Bay or simply enjoy the world famous fish & chips at Mangonui! Whatever you do – don’t miss Northland. Bay Of Islands Region New Zealand Self-Catering Accommodation in Bay Of Islands - Self-catering accommodation listings. This is the big game fishing capital of New Zealand so have a go or just relax on the beach and watch the boats come and go. Stroll along the magical waterfront of Russell and imagine the hurly burly pioneer days. Don’t miss the Mission House at Waimate North, the Stone House at Kerikeri or, of course, the fabulous grounds, setting and historical significance of the Waitangi Treaty House and Grounds. A small geographical area that packs a punch! Auckland Region New Zealand Self-Catering Accommodation in Auckland - Self-catering accommodation listings. Known as the Queen City of the South Pacific you can shop your heart out here. Taste the café culture of Parnell or Ponsonby, catch a ferry to Waiheke Island for a spot of wine tasting or chill out on the waterfront oogling the superyachts. There is so much to see and do in Auckland, you’ll need a comfy bed for a few nights here! Waikato Region New Zealand Self-Catering Accommodation in Waikato - Self-catering accommodation listings. Don’t be misled by the symbolic cowbells – there is more to the Waikato than dairy farming. From the superb public gardens of Hamilton to the spellbinding magic of the Gloworm caves of Waitomo, be prepared to be entranced by this lovely region. Take in the surf beaches and sunsets of Raglan and the history of Kawhia if you can. Coromandel Region New Zealand Self-Catering Accommodation in Coromandel - Self-catering accommodation listings. Timber, gum and gold are all entwined in the history of this magical region. Gorgeous beaches and fascinating walking trails abound. The fishing is great and the climate (mostly) balmy. What more could you want? Bay Of Plenty Region New Zealand Self-Catering Accommodation in Bay Of Plenty - Self-catering accommodation listings. Enjoy the restaurants, bars and cafes of Tauranga’s waterfront Strand or the beach and boutiques of Mount Maunganui, then try something fresh and tasty from the orchards that abound in this aptly named region of plenty. Eastland Region New Zealand Self-Catering Accommodation in Eastland - Self-catering accommodation listings. Rugged, packed with history and very different, you’ll love the Eastland with its big, empty beaches, rolling surf and spectacular countryside. As you visit some of the small rural towns you will feel the years rolling back. Don’t miss Tolaga Bay with its long wharf and the drama of nearby Cook’s Cove, or the incredible vista from Cook’s Plaza above the city of Gisborne. 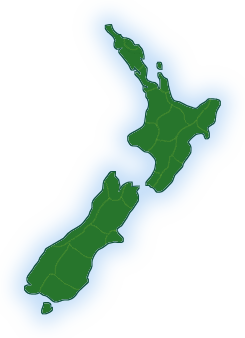 This is one of the wine regions of New Zealand too, renowned for its fine Chardonnays. Central North Island Region New Zealand Self-Catering Accommodation in Central North Island - Self-catering accommodation listings. Rotorua must be the “Maori Cultural Capital” of New Zealand. It is also well endowed with beautiful lakes, steaming terraces and spouting geysers. Look carefully and you will find secluded natural hot pools hidden in forests. Taupo’s splendid outlook over the lake to the majestic mountains beyond is truly a sight to behold. Catch your breath at the magnificent Huka Falls or catch a trout for dinner! Tackle the awe inspiring Tongariro Crossing or ski the slopes of Mount Ruapehu; you won’t run out of sights to see or things to do. Hawkes Bay Region New Zealand Self-Catering Accommodation in Hawkes Bay - Self-catering accommodation listings. Visit "The Bay" for Napier’s art deco buildings and its waterfront with the distinctive Norfolk Pines. And the wines! Superb vineyards abound, many of them with cellar door shops & tastings. Hastings is surrounded by luscious orchards and don’t miss a trip up Te Mata Peak for an amazing vista. An excursion to Cape Kidnappers is well worth the effort too. Taranaki Region New Zealand Self-Catering Accommodation in Taranaki - Self-catering accommodation listings. The almost perfect volcanic cone of Mount Taranaki dominates the region. The usually snow capped peak forms an everpresent landmark. There are some amazing walking opportunities on the slopes too. Renowned also for its gardens, especially rhododendrons, and surf beaches there is plenty to see and do. If you have the opportunity, be sure to travel the “Forgotten Highway” and you will see some of the true New Zealand! Manawatu Region New Zealand Self-Catering Accommodation in Manawatu - Self-catering accommodation listings. From the rugged country of the Whanganui River and National Park to the Ruahine Ranges, to the awe inspiring Manawatu Gorge, this is great country for the outdoorsman (or woman). The urban centres of Palmerston North and Wanganui have their own attractions too. Try the Jazzboat Festival in Wanganui or visit the Rugby Museum in Palmerston North to learn about New Zealand’s passion for the sport. Wairarapa Region New Zealand Self-Catering Accommodation in Wairarapa - Self-catering accommodation listings. Although often thought of just as a pleasant farming region, there is much more to the Wairarapa than many imagine. From the orchards and antique shops of southern Wairarapa head out to the wild & rugged coast where excellent crayfish abound. On the way don’t miss the excellent vineyards of Martinborough. In the northern Wairarapa a visit to the internationally acclaimed Mt. Bruce National Wildlife Centre is sure to fascinate, as is the nearby Mt. Bruce Pioneer Museum. Wellington Region New Zealand Self-Catering Accommodation in Wellington - Self-catering accommodation listings. The capital city with its unique beehive shaped parliament has plenty to keep you interested. Known as the cultural capital, the city abounds with theatres, museums and galleries. Don’t miss the National Museum, Te Papa. Ride the quaint cable car for a view of the city or take an excursion up Mt. Victoria to experience the bracing Wellington “breeze” straight from the Antarctic! And the views. In the north of the region lies the coastal Queen Elizabeth Park with its tramway museum, the golden beaches of the Kapiti Coast and the fascination Southwards car collection. Nelson Region New Zealand Self-Catering Accommodation in Nelson - Self-catering accommodation listings. Be spoilt for choice here! The Nelson region is renowned for its arts & crafts, fine orchards, vineyards and superb seafood. And that’s just to start with! There is the outstanding Abel Tasman National Park with its acclaimed walking track and sea kayaking opportunities; the lovely semi alpine village of St. Arnaud, base for the Nelson Lakes National Park and nearby ski fields. Enjoy the massive expanse of beach at Tahunanui and watch the sun set over the Tasman Mountains. An excursion right out to the lighthouse on Farewell Spit is something not to be missed. Marlborough Region New Zealand Self-Catering Accommodation in Marlborough - Self-catering accommodation listings. There are two sides to Marlborough: the magical waterways of the Marlborough Sounds and the wine country of Blenheim. Be sure to experience them both. Charter a boat to cruise the waterways and discover quiet, secluded bays, or take one of the commercial launch trips to stay at a romantic waterfront lodge with no road access. The famed Queen Charlotte Walking Track winds its way through the forests and above the bays; and be sure to visit Captain Cook’s favourite spot in New Zealand – Ship Cove. Head for the wine country around Blenheim and sample the fabulous wines including the world beating Marlborough Sauvignon Blancs. West Coast Region New Zealand Self-Catering Accommodation in West Coast - Self-catering accommodation listings. North Canterbury Region New Zealand Self-Catering Accommodation in North Canterbury - Self-catering accommodation listings. Descending from the “Dry Hills” of southern Marlborough a quite fantastic sight greets you – the stunning Pacific coastline of North Cnterbury! Flanked by the majestic Kaikoura Ranges on the landward side and the pacific Ocean on the other, this is a trip of pure magic. Go whale watching or swim with the dolphins at Kaikoura; ski at Mt. Lyford then head inland to the fabled hot pools of Hanmer Springs. See the strange limestone formations and explore the wild rivers of the Hurunui or sample the wines of Waipara. Mid and South Canterbury Region New Zealand Self-Catering Accommodation in Mid and South Canterbury - Self-catering accommodation listings. Catch a salmon at the Rakaia River or head inland towards the mighty Mt. Hutt Ranges. Time your trip right and you can even try your hand at curling in Staveley! Don’t miss Lake Tekapo where you can marvel at the crystal clear night sky by night and the iconic lakeside Church of the Good Shepherd by day. A highlight for any traveller has to be a visit to Mt. Cook. Just keep your fingers crossed for a fine day and you won’t have seen anything like it for pure majesty! You can spend a day travelling the roads of the South Canterbury countryside and fail to count enough cars to run out of fingers! Christchurch Region New Zealand Self-Catering Accommodation in Christchurch - Self-catering accommodation listings. Christchurch is definitely open for business! Despite the recent earthquakes there is plenty to see and do, and so far as accommodation in concerned, it is only a few of the central city hotels that remain closed. So, come and enjoy the parks and gardens for which the city is renowned. Be sure to put a visit to the Antarctic Centre on your list of "must do’s". For a superb experience and stunning view of the Southern Alps, take an early morning hot air balloon trip. Banks Peninsular will captivate you too. In fact you might want to overnight in picturesque Akaroa with its fine cafes, restaurants and dolphin experience trips. Otago Region New Zealand Self-Catering Accommodation in Otago - Self-catering accommodation listings. Some say that Dunedin is more Scottish than Scotland! Watch the “scarfies” as they scurry around the vibrant university campus and browse the bookshops in the central city Octagon. Out on the Peninsular you will be captivated by the Royal Albatross colony. There are marvellous penguin watching opportunities too. Inland, you could try cycling the Central Otago Rail Trail or take the stunning backcountry trip via Dansey’s Pass and Naseby. This is rugged pioneer gold mining country steeped in history with spectacular scenery to entrance you. Southland Region New Zealand Self-Catering Accommodation in Southland - Self-catering accommodation listings. And don’t miss the opportunity for a visit to Stewart Island. People have been known to go for a day and stay for a lifetime! This is nature at its best and living as it was. Oh, and if you can catch a bigger blue cod anywhere else, tell us about ! Southern Lakes Region New Zealand Self-Catering Accommodation in Southern Lakes - Self-catering accommodation listings. The Southern Lakes area takes in some of the top sights & experiences of New Zealand. It is hard to imagine anything more picture perfect than the sight of the SS Earnslaw steaming out onto Lake Wakatipu from Queenstown against the backdrop of the mountains beyond. Are you up for a Bungy Jump? Wanaka is the more relaxed cousin of Queenstown and the trip between the two over the Crown Range is stunning. From Te Anau make a day trip to Milford Sound. You may run out of superlatives – this is just stunning in the sunshine or the wet. Another worthwhile day trip from Te Anau is a visit to the Manapouri Hydro scheme.